On top of residential and commercial capabilities, solar power has now entered municipalities, with 16 U.S. cities on track to become 100% powered by green, renewable energy in the next 20 years. Solar power plays a large part in reaching this goal, providing entities with the means to effectively transition from standard electricity to solar energy. The worldwide initiative to embrace solar energy also creates a unique opportunity for the transportation industry. Dynamic Message Signs (DMS), traffic cameras, Bluetooth readers, and other detection equipment can all be optimized to harness an energy efficient power source. The potential solar power has to improve the ITS industry is immense. 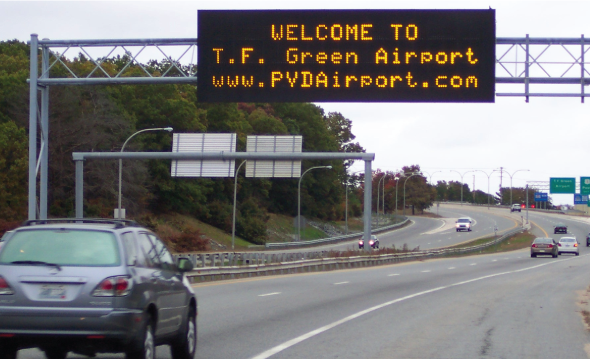 Solar powered signs can reduce Department of Transportation (DOT) maintenance costs by 50% and provide 100% return on investment in just four years. In addition, the utilization of solar power can cut installation time, energy, and expense, as well as the amount of civil works necessary to run great lengths of wires and electrical systems from the grid to the sign. As for long-term benefits, solar DMS can completely eliminate recurring energy costs and help their municipality and DOTs on journey to a 'green footprint.' With the right provider, solar power DMS can be a lasting smart solution to energy-efficient ITS. When making the leap to a solar powered system, your first concern is going to be feasibility. The system feasibility and costs is determined by the amount of power you need, so choosing energy efficient products is the key. When designing a Solar DMS, it is critical to take into account size, roadside conditions, cost, and energy efficiency. Since 2011, the cost of photovoltaic (PV) panels – a major part of the system – has dropped from $1.30 per watt to $0.70 in 2016. The reduced costs of solar components, on top of the cost savings DOTs and municipalities experience, have helped make solar power more widely feasible. However, cost is not the only factor. The first stage of calculating an optimized solar system is known as the critical design analysis, which means planning for the worst. By balancing high energy consumption loads with low solar energy insolation, you can determine the critical design ratio. Once the critical design month is set, DMS manufacturers can then use this data to accurately size the entire system and develop a strategy to increase system availability. When performing a load analysis, energy consumption dictates the amount of power needed to make ITS devices work. Load analysis takes into account existing and future energy loads, monthly vs. annual load profile, peak power demand, and energy consumption. You must take consider all equipment and not only the DMS, for example communication devices, sensors, chargers, etc. To ensure proper system sizing, load analysis requirements must be detailed, as load analysis can vary greatly based on how power consumption is calculated. For instance, should all devices be calculated at max power for 24 hours/day? 50% power for 12 hours/day? Thorough detail on desired calculation of power draw for each device will ensure optimal system sizing, and avoid system undersizing which can lead to failure. Autonomy looks at how much reserve power is needed in the battery bank to power systems without available solar energy. When determining the desired autonomy of a sign, a DMS engineer takes a look at the critical design analysis and figures out how much energy the system needs to have on reserve to function 24/7 – with or without access to the sun. To achieve the level of desired autonomy and meet load requirements, the team responsible for the DMS design needs to look at the battery bank configuration. How many solar panels are necessary, given the location, to capture the ideal amount of sunlight necessary to recharge batteries? Battery bank configuration establishes the system's DC operating voltage and considers factors such as temperature and depth of discharge. The solar PV array must be sized to produce the electrical energy needed to meet the load requirements during the critical design month, while still accounting for normal system losses. Using the right technologies and configurations, this step takes into account solar insolation, PV panel tilt, and potential losses such as panel/battery deterioration and temperature. While it seems logical and more environmentally friendly to use solar power in the ITS industry, it is critical to accurately calculate an optimized solar system to reap the optimal benefits. Otherwise, you may end up with a solar panel that cannot perform in all conditions, which can result in a malfunctioning DMS that has the potential to lead to major transportation issues. While there may be many myths surrounding the usage of solar powered DMS, choosing a reliable manufacturer can make all of the difference. The most important factor is to select energy efficient DMS. The less energy you need to power your system the cheaper the solar chain will be. The success of a solar powered DMS hinges on the provider’s ability to design and install the system according to specific needs. 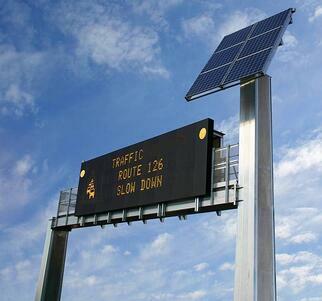 Solar power is a sustainable, innovative solution for ITS devices with the right system provider. Whether you’re a DOT professional, an engineer, or a consultant, SolarSigns from SESA can be the innovation you need to make operations more cost-effective, energy-efficient, and reliable. Your organization can enjoy flawless autonomy, reduced maintenance, and a green footprint. With the overall reduced costs of this technology and the innumerable benefits of switching to energy efficient solutions, solar power DMS is now a feasible option for large and small entities around the world. Interested in learning more? Watch our on-demand webinar!